Today we have an extremely exciting announcement here at TTCombat. We have completed a deal with Hawk Wargames to purchase both the incredible Dropzone Commander and Dropfleet Commander. For the past few months we have been talking to Hawk about handling their logistics. The difficulty of off-site production combined with fulfilling one of the most successful UK wargaming Kickstarters of all time was putting strain on their business. David Lewis is one of the most talented designers in the industry; he’s made two amazing games and a beautiful range of miniatures to support them. However, as time went on, David found himself spending most of his time running a company and dealing with the fall-out from the Dropfleet Commander Kickstarter. After discussions on how to best move the business forward into 2018 and beyond, we both came to the conclusion that it would be better for Hawk Wargames to become a part of the TTCombat family. David is of course staying on as lead designer and will now have his time freed up to do what he does best: design breath-taking miniatures. The TTCombat team have been working on a range of buildings and accessories which will launch alongside Dropzone Commander 2.0 at Salute in April, and there will be plenty more before then! We have a lot of moulds that require remaking, so some supplies may be a bit short while we facilitate the transition, so we please ask all the DZC and DFC fans to be patient with us during this time. If you’ve followed TTCombat in the past, you’ll know that it won’t be long before everything is up and running. The Dropfleet Commander Battle Fleet box deals will finally see release at the end of November and we are already building a good quantity of stock to ensure we can meet demand. David has already begun work on the destroyers for Dropfleet and they are looking fantastic! 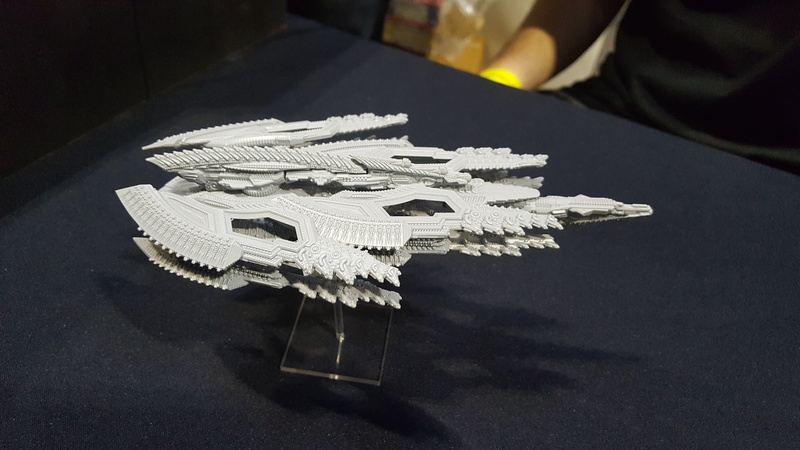 The Dropfleet Commander Kickstarter still has some items outstanding, and we at TTCombat will be ensuring that all backers will receive all of their rewards promptly. If we have to make your toys from scratch then we will get pouring resin! There are also some outstanding vouchers, which of course we will be honouring via the TTCombat webstore. Once we have organised the stock we have collected from Hawk and got it all listed, you’ll be able to choose from any Dropzone Commander or Dropfleet Commander products, or the full range of TTCombat games, scenery, and accessories! The next couple of months will be a little hectic as we get everything back on track, but once we do, hold on tight! We have some exciting years ahead... a third Commander game in 2018 anyone? The UCM Dreadnought is 'about 2 inches longer and 1 inch wider' than the UCM Battleship. Probably no leaks at Salute as they will be swamped by Destroyer rules, casting and selling! Worth noting that the combined Dropzone/Dropfleet Rulebook is due in Summer and will revamp DfC: armour rules might change across the board - possibly to be more like 'Ceramic' - and all Battleships will improve to 2+ Armour. Link is from TTCombat page, More=>Resources=>Dropfleet Commander Resources=>Princess Liner Scenarios. 1. Dreads and Destroyers are not the only new ships in the Earth campaign book, but he's keeping quiet on what else is going to be in it. 2. "Big Ticket Thing" in the book for both DFC and DZC that is NOT the Dreadnoughts. 3. Dreadnoughts don't just burn up in the atmosphere, they crash and destroy everything underneath them (described as a "localized extinction level event") and will have their own catastrophic and crippling tables. 5. Scourge Dreads are the Nosferatu (the one in the case, has a lot of the occulus weapons) and Cthulhu (3 BTLs). Side note: He called out the forums and chuckled that somebody already called the Cthulhu name. Nosferatu has Stealth and Full Cloak but 3+ armor. 6. PHR dreads we only know the one in the case is the Romulus, the side weapons are energy weapons called "Energy Glaives" and has a new rule called "Overcharge" which they allows them to go weapons free, but instead of firing all weapons, they do twice the damage. He mentioned under overcharge one broadside from the Romulus deals 16 dice at 3+ damage 2. 7. The known Shaltari dread is the Uranium. It's sig is 12"/36". Has twice as many Maulers as the Destroyer, a Microwave Cannon, and a bunch of disintegrators. with some additional info from Neil Stegman. 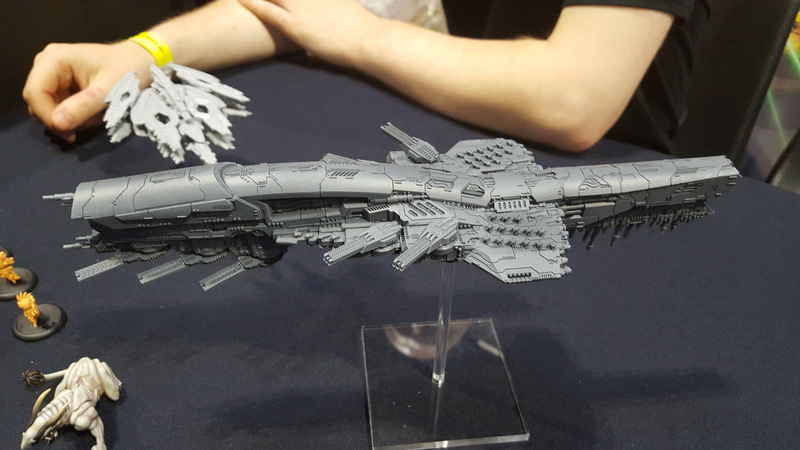 Dreadnoughts: what we know so far including the updates from Gen Con 2018. 1. As per their historical influence these are larger and more powerful than Battleships. 'Any of these Dreadnoughts will destroy a Battleship in one salvo if they mean business'. 2. Each Faction has two designs, ‘the box will have parts to make either’: No way these will fit in Blisters so expect boxes with great art such as the recently revealed Scourge Dreadnought art. 3. Dave Lewis said they will cost about 500 points and there may be a specific rule that allows them to appear in 1,250-point games since that's the de facto standard now. 4. Dreadnoughts to go on sale in August. >Not yet confirmed and now seems unlikely. 5. Dreadnought Stats are in the new 'Battle for Earth' book due to launch in Q1 2019 (he clarified this would be March or even delayed to April). 6. They have been play-tested a lot and rules might change but they are 'pretty set now'. 7. Dreadnoughts will have their own Crippling and Catastrophic Damage tables and will never simply ‘Burn Up’: if a Dreadnought is crashes to the ground it will wipe out everything in a huge area beneath it in ‘an extinction level event’. It is also stated that those exploding in Orbit will do so with a large, fixed radius. Note that the DfC background text ('fluff') puts the UCM Dreadnought inventory at '9 Dreadnoughts and 5 Supercarriers'. The Romulus has an Overcharge mechanic (Weapon Special Rule) which doubles the damage of energy weapons on Weapons Free: Dave Lewis then described this bringing the broadside up to '16 dice, 3+ Lock, 2 Damage each', but he also said you can 'only fire one of these weapons' so I suspect this means you can't fire the Laser if you are Overcharging the Broadside and/or you may not even be able to fire both Broadsides in this mode. Another attendee was told that the Romulus does have the 18 side attacks implied by the model and that they operated as 3 Linked Weapon System, each with 6 attacks (again this matches the model). But he was told that rather than doubling the damage, the attacks were doubled instead. In either case the max output is the same (36) and the other Side can’t fire as you Overcharge a chosen Side. As Dave is quite clear on it being ‘double damage’ / ‘2-damage each’ in the TTCombat video, I am very much of the opinion that the damage will double as doubling. Double attacks would be too close to Fusillade and less thematically accurate for a ‘Direct Energy Weapon’. 26 Hull, 3+ Armour, Stealth and Full Cloak. Nosferatu: 'A whole lot of regular Oculus weapons’. Cthulhu: 'Three big Lasers on the front'. Uranium: I've counted 12 Large and 12 Medium Guns per side, these are in 4 banks of 3 Large/3 Medium so could be capable of engaging 4-8 targets per side. Overall I could see 48 obvious guns; there may be more on the spine. >‘Twice as many Maulers as the Mercury’, Heavy Microwave Cannon on a Turret and many Disintegrators. ". They have been play-tested a lot and rules might change but they are 'pretty set now"
Ein paar Restbestände gibt es bei https://www.laughingjack.de/tabletopspiele-miniaturen/dropfleet-commander/ sogar mit 30% Rabatt. Und könne auch vorbestellt werden. Sie kosten 50£ das Stück. Test-Errata welches auf dem Turnier in Cleveland ausprobiert wurde. So oder so ähnlich wird wohl das offizielle Errata aussehen. Gibt aber mehr Dinur die effektiver gegen Strike Carrier etc vorgehen können. We have now updated the errata used at the Cleveland clash and created a version for Adepticon. This is the version that will be used at Adepticon, both narrative event and tournament. Players attending these events will be contacted separately since they might not all be hanging around here. The content has been created by a group of dedicated gamers and TTCombats own Donald Roach Jr. Game creator and mastermind Dave has also been instrumental in its final version, taking some time off from finishing the work on Battle for Earth! Direct any feedback to me, Donald Roach Jr or Josh Shivak. CV1 podcast and the Scald youtube channel will be discussing this release in future content. Stay tuned in for more information!